Here's a quick rundown of our situation (summarized as best I can from the massive stack of medical records I have here!). My husband is 35 and has no health problems. I'm also 35 and was diagnosed with endometriosis and lost one ovary in 2008. I've had problems with cysts and pelvic pain for the past 9 years. Surgery #1 (October 2001): Just six weeks before my wedding, a large mass was discovered. Laparoscopy to remove a 10" paratubal cyst (benign serous cystadenoma). Nothing's been the same since! All labs on mom normal, except "moderate positive" result on anticardiolipin antibody IgG, which we're told is not significant; after six weeks this was retested and the level was "inconclusive"
Surgery #2 (January 2008): Explorotory laparoscopy. 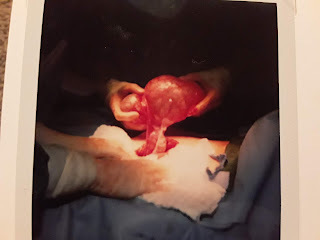 I lost my right tube (had been badly damaged by previous 10" cyst) and right ovary, though I think it should have been saved as it only had a small endometrioma. I ended up in the emergency room six days post-surgery for a hematoma. After recovering from surgery, we started trying to conceive again only to find that I'm now infertile. May through July - on the Pill because of large painful cyst! October through December - on the Pill because of large painful cyst! November 2010 - IVF #2: 11 eggs retrieved, 4 mature, 3 fertilized, 2 transferred on Day 5 (1 blastocyst, 1 morula), none to freeze - Positive! Pregnancy #6: Anastasia born August 2011 at 40 weeks!! Cord and placenta look normal; Apgars 9/9; she's perfect! Pregnancy #7: In March 2015, I was shocked and terrified to find that I've gotten pregnant naturally. After reliving the terror that is high-risk pregnancy, I had a healthy girl at term. We found out only after she was born that she had cord stricture as well. 2015-present: We are DONE with this whole business! Q got a vasectomy. The kids are all healthy and growing well. I have enjoyed 8 years free of endometriosis pain...a wonderful and unexpected bonus! I just read the stories of Jeremiah and Miles, and am literally fighting back tears here at work. My heart breaks for you and your husband, it truly does. I wish y'all all the best, and hope no more tragedies strike. It's an understatement to say that, but really, any words are not enough for what you've been through. I've had two Children with UCA compression with torsion. One survived and one was still born on May 2, 2011. We are trying to conceive again.